This blog post is the sequel to Part 1. In this chapter we are going to dive into CSS so we can learn the principles of how to layout things on a web page and understand how to build layouts! Good old CSS colors... peachpuff background with a firebrick flare. What's your favorite named CSS color? In the above example, we are making use of classes and IDs. You can see the div element has an ID of container. In the corresponding CSS, we reference it with a hashtag, i.e. #container. Likewise, for the h1 element, we have given it a class of greeting; this is reference with a dot in the CSS, i.e. .greeting. Pretty intuitive once you get used to it! But what's the difference between a class and an ID? (That might be an entry-level interview question actually!). Well, an ID is designed to be unique in a webpage, i.e. it should reference a single HTML element only. Classes, however, can be applied to many HTML elements. Now that we're clearer on classes and IDs, and we have some boilerplate code, we can start diving deeper into CSS. The box model is the backbone for CSS on most websites, and it is essential to understand before moving on to more advanced CSS topics you may have heard of like flexbox and grid. Padding - the space surrounding the content before the border. Border - an edge around the content, like a picture frame. Set to 0 by default, so you have to add a border-width to make it visible. Margin - the area surrounding the border. Very similar to padding, but on the other side of the border. Also, margin will push up against other boxes and move them away. Let's apply all of these to our CSS. The padding uses shorthand. It applies 10 pixels to top, bottom, left, and right. You can separate these out (padding-top, padding-left, padding-right, padding-bottom) if you need to get more specific. More Info. The margin also uses shorthand. Here it is 20 pixels for the top/bottom, and 50 pixels for the left/right. 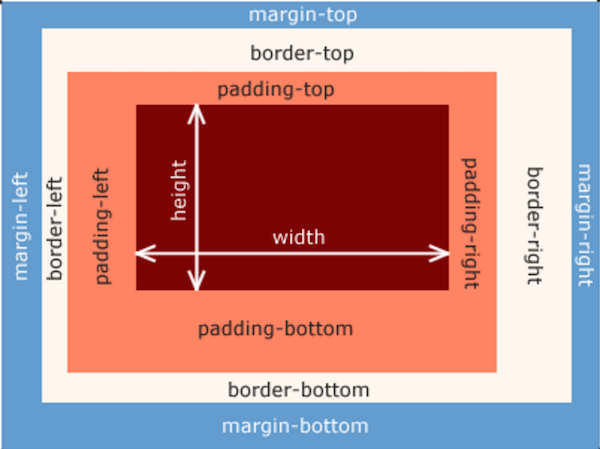 Like padding, there are margin-top, margin-right, margin-left, and margin-bottom properties. More info. The border is also shorthand: 5 pixels wide, solid border (as opposed to dashed or dotted), and the color is mediumvioletred obviously. These can all be separated out into their own properties. More info. A tool that is going to be indispensible for web development is going to be the Google Chrome DevTools HTML/CSS inspector. On our page, if you right-click and select "inspect element" (shortcut, command + shift + i on Mac), you will get information about the HTML and styles, including a nice visualization of the actual box model in the bottom right! Best of all, things here are dynamic - try changing some of the CSS and watch it update on the page automatically. Check out Google Chrome's DevTools CSS tutorial here for more info. As always, the true path to becoming a great developer is by getting your hands dirty and practicing yourself. Here is some starter code (in a CodePen) with a picture of a kitten. We totes want to frame this, so use your CSS box model knowledge to make it look like the picture! Note that this picture is horizontally-centered, because why wouldn't you want this in the middle of your wall? Warning: the above code contains styling in the HTML known as inline styling, and you shouldn't do this most of the time. More on this later! We have already observed that div and h1 (or any header) tags are block-level elements by default;. Other common block elements are p (paragraph), ol and ul (ordered and unordered lists), and li for list items. Other elements are considered inline, which means by default they will place the content box on the same line adjacent to the previous element. The most common inline-block tags are a (anchor tags for links), img, button, and span. Lastly, as a handy CSS trick, you can override the default behavior of block or inline elements by setting the display property to block or inline, if you want to set it explicity. Click here for more info. That's it for this time, hopefully you're beginning to feel more comfortable with CSS and you can start inspecting elements to see the box model in practice! What is the difference between a class and an ID? What are the Chrome DevTools good for? What's the difference between a block and an inline element? What is your favorite named CSS color? To continue learning how to code, our free curriculum goes into more examples here. For some more practice, let's make a cheesy motivational poster in pure HTML and CSS!